Last week, the basics of teledermatology was introduced – What Teledermatology is, its different forms and patient points when getting started on it. 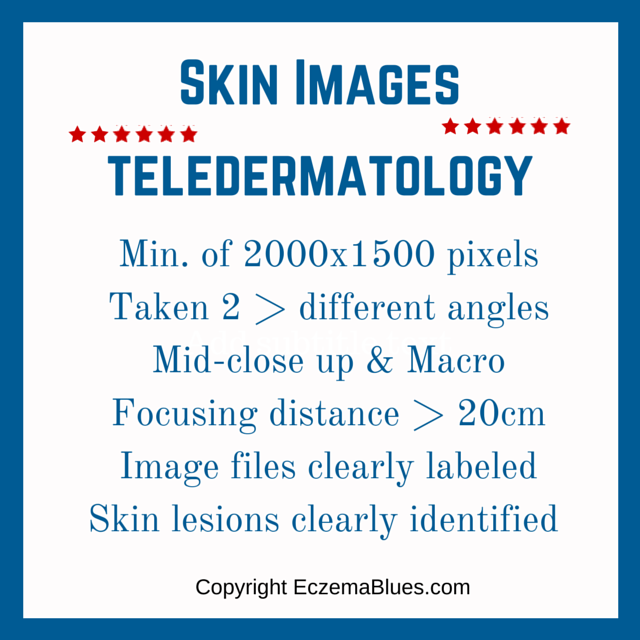 Today, we continue with the 2nd part of this 5-part series, focusing on a central part of the teledermatology process – Skin Images and Patient Information. Much of the guidelines are obtained from the British Association of Dermatologists’ Quality Standards for Teledermatology. The focusing distance should be at least 20cm for macro close-up. Skin lesions can be identified using sticky labels, surgical tape or washable markers. In Store and Forward Teledermatology, capturing quality images, recording accurate and complete information is a critical success factor. If the dermatologist is comfortable with the quality of imaging and information, it is less likely that you will be called in for an in-person consultation. What is your experience? Were you provided with adequate information BEFORE you consent to teledermatology and did you feel that your referring physician recorded all the requisite information? Share in the comments so we can benefit from your experience!